I’ve wanted to record this project for years but I had two problems: it never felt right recording a Christmas project in the summer, and once the holidays got closer it was always too busy to fit in the schedule. That happened a few years in a row. Which gave us time to really hone the arrangements, so this year we just knocked it out. A day and a half of Mandy on viola and harmony, a day of drums with Johnny, a couple evenings of bass with David, an afternoon with Kemper playing and singing, an evening and a morning with Rob on keys and a half a day with the other Rob on percussion. Jonathan came over one evening to sing on a couple tracks and Angela came over one afternoon to sing on a couple others. I handed all the tracks to Alan and he had ten days to mix and master. I promised a Thanksgiving Day release and I had the final mixes in hand the day before Thanksgiving. Quickest recording project I’ve ever been part of! I asked my daughter, Von Behr, to do an oil painting for the cover and her art teacher Elizabeth gave her some direction as she went. The idea was to paint a blue and white wintery abstract with a black skeletal Christmas tree in the foreground. The tree would be partially decorated with lights symbolizing how we mostly celebrate Christmas during the Advent preparation time leading up to Christmas day. It is a Christmas tree in progress—which could also be understood as the world in the process of being adorned by the Gospel, awaiting the arrival of Christ in glory. That’s why the album ends like we’re standing outside a church with the organist playing the final hymn inside. Christmas songs are some of the oldest songs most of us know. Each generation takes the familiar melodies and reincarnates them, bringing them to fresh life for their time. That’s what we were attempting to express on this project by playing these songs in a variety of musical styles. 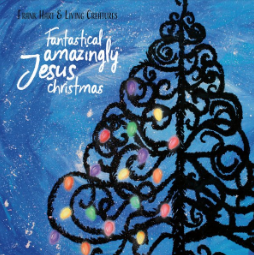 I hope you enjoy the Fantastical Amazingly Jesus Christmas project as much as we did making it. I hope it brings you joy and deepens your understanding of what it means that Christ has come to us and become man.